With prices starting from €203 per month on PCP, drivers looking to make the switch from diesel to the more environmentally and economically friendly hybrid will find it very affordable to do so. Marking the new generation of the popular C segment car, the all new Corolla hatchback boasts a visually distinctive look with a lower stance and more appealing proportions. Corolla hatchback boasts a new dynamic exterior design and a brand new 2.0 litre full hybrid powertrain, which joins the 1.8 hybrid and 1.2 petrol engine variants. Priced from €203 monthly on PCP, the Corolla hatchback hybrid is available from €26,370, and the 1.2 petrol Corolla hatchback is priced from €25,995. Corolla Hatchback can now be pre-ordered with deposits also being taken. The new Toyota Corolla Touring Sports features a strikingly dynamic design with sleek lines and eye-catching LED headlamps. With a wheelbase of 2700 mm and 4653 mm in length, the Touring Sports has best-in-class rear seat passenger legroom and was built for people looking for practicality and style without compromise. The Corolla Touring Sports is available as a 122 hp/1.8 litre hybrid, 180 hp/2.0 litre hybrid or 116 hp/1.2 litre conventional petrol powertrain. Available to pre-order now, with prices starting from €28,420 or €234 monthly on PCP. After a 14 year absence from Ireland, the new eight generation Camry returns in early April 2019 with a newly developed 2.5 litre hybrid engine, a power output of 218hp, best in class fuel economy and an expected best in class CO2 output, all of which is sure to make it a very popular choice for business executives. 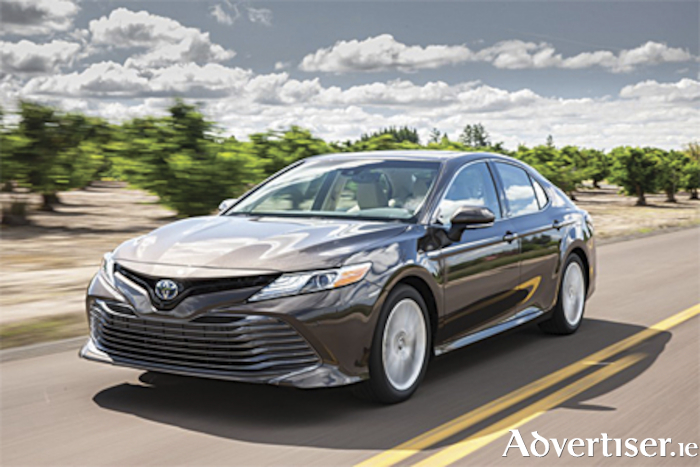 The Camry hybrid is available across three grade options with prices starting at €39,750 or €300 per month on PCP. Pre-orders are now being taken. Available to order now, the all new RAV4 Hybrid with a new 2.5 litre engine is 10mm wider and 30mm longer wheelbase than its predecessor and offers a more spacious and comfortable cabin combined with an increased luggage space of up to 580L. RAV4 Hybrid is priced from €35,900 or €278 per month on PCP. Toyota also says that it has a suite of 191 promotional offers across its range. It claims to offers APR’s from 2.9 percent on passenger cars and 1.9 percent on commercial vehicles. It also says that hybrids come with a lower monthly payments over a petrol even though a Hybrid car has a higher retail price to a petrol equivalent. The monthly repayments over a 37 month P.P term on a hybrid will be less due to a higher guaranteed future value (GMFV ), coupled with a lower APR for a hybrid. Customers will have a lower monthly payment on a higher grade hybrid, rather than a lower grade hybrid. This is possible by having a lower APR rate on Toyota’s Luna grades and higher. A customer, for example can upgrade from a RAV4 Aura grade to a RAV4 Luna grade for a lower monthly payment. Toyota are also offering trade in boosters up to €3,000 on select passenger and commercial models. And it promises that all Toyota passenger cars now come standard with three years servicing, offering customer’s peace of mind for future planning.